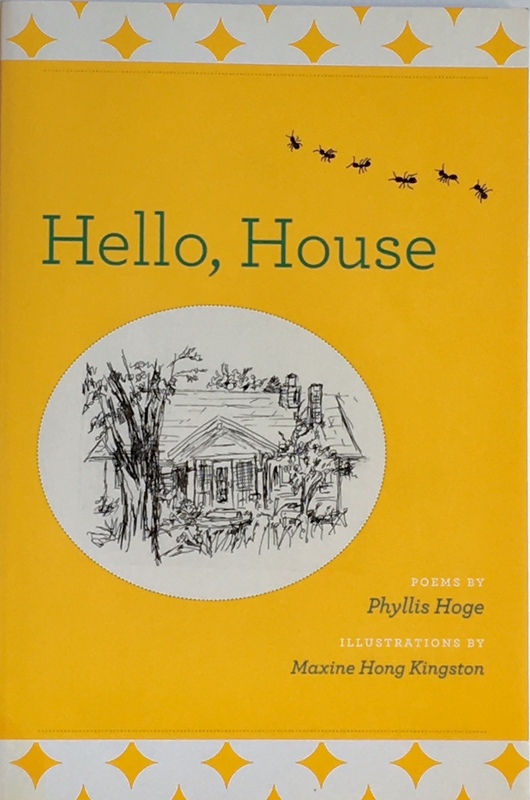 The poet, Phyllis Hoge Thompson, died recently, after a long life filled with raising four children while pursuing her doctorate, teaching at the University of Hawai’i, writing volumes of poems, plus a memoir. 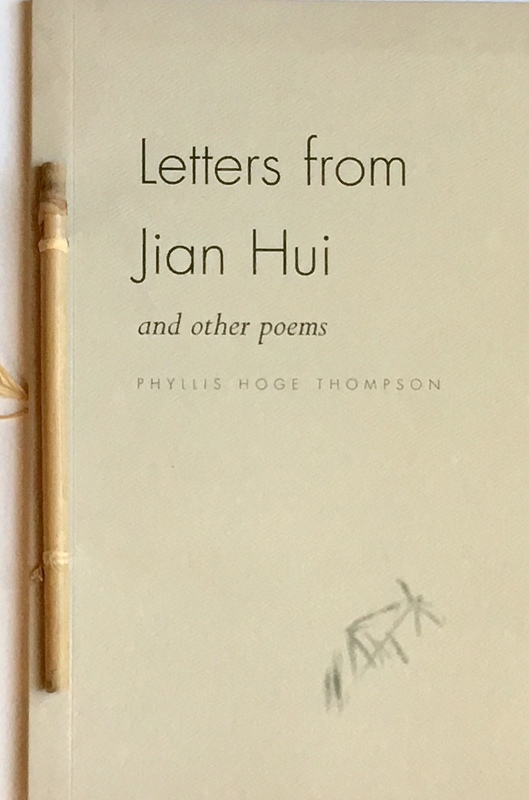 She relocated to Albuquerque, New Mexico upon retirement “to experience the four seasons, among other things.” She lived a year in China, teaching English. She regularly went to Yaddo to work on manuscripts that subsequently got published. In 1995, she was awarded the Hawai’i Award for Literature by then Governor Benjamin J. Cayetano. Phyllis also loved art, and supported many artists, like myself, by not only buying their work, but also by valuing what we, as artists, bring to the world. Today, McCauley’s French window: the rose-fallen light Echoes a lost aubade, a way of being I lift the picture, position the wire just right, And drift off into the life I live by seeing. Her home was a modest two-bedroom, with hardwood floors that were covered with worn oriental carpets. Family furniture—mostly wood—crowded the rooms, and shelves filled with books lined most available walls. Above and around them art: paintings, two small tapestries, photographs, ikat weaving, sculptures, drawings, art quilts, turned wooden bowls, and cobalt blue glass balls of varying sizes. More books in a pile on the floor by her reading chair, as well as stacked on the living room coffee table and on the end table by her bed. “I am confused about where this is going. Do you intend this to be…?” Or do you mean..? Invariably the responses helped me to re-think passages, trim out excessive words, say more about specific areas, as well as to know what really worked well. It felt like a gift, even when I needed to set aside a draft and start fresh again. Over the months, we read articles for publication, chapters of books, and excerpts from our journals. We listened carefully and deeply. We responded with honesty and tenderness. We grew to love each other. I carry the spirit of the Friendly Writers Group into my teaching. I listen carefully to my students, to both the asked and unarticulated questions. I encourage group feedback on designs, and make suggestions of options to think about. I also bring deep listening into my own creative process, in the initial designing stage as well as when weaving on the tapestry in-progress on the loom. Often I work in silence, allowing it to enter and expand through me into images flowing from the pencil in my hand onto the paper, as I sketch layers of shapes and textures, as I observe and study what is before me. Early each morning before weaving, I will sit in silence and wait. Invariably, ideas emerge about use of color mix choices in yarn bundles, and technical decisions for what needs to happen next at the loom. Navajo Textiles: The Crane Collection at the Denver Museum of Nature and Science. Authored by Laurie D. Webster, Louise I. Stiver, D.Y. Begay, and Lynda Teller Pete, plus Ann Lane Hedlund, who wrote the introduction. I first saw this book at the Albuquerque Public Library in their “New Arrivals” section. The cover alone grabbed my attention and I had to pick it up. As I spent time gazing at the pictures, reading different chapters, I came away profoundly moved. This book began as a simple invitation to write a catolog about the Navajo textile collection at the Denver Museum of Nature and Science (DMNS) and grew into a collaboration and friendship among Navajo and Anglo textile scholars. The four of us share the love of Navajo textiles, and two of us grew up weaving them. We each contributed different expertise and knowledge and learned from each other in the process. We also had lots of fun. One by one, staff unrolled the 130 (out of 380) selected textiles. Few had ever seen many of the weavings—some were so stunning as to leave even the experts momentarily speechless. Then, each scholar began to share her viewpoint. Each perspective enriched the others—weaving together the strands of technique, history, culture, place, and personal experience. In addition to its many stunningly beautiful textiles, this book is also an eloquent glimpse into history, culture, and the multifaceted role of Navajo textiles across generations. 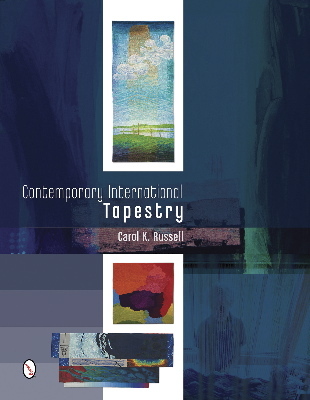 Each author’s essays and narratives, as well as the commentary and descriptions accompanying each textile, is a full and generous sharing of personal, historical, and scholarly perspectives. The power of this collaboration speaks so well for how textiles can bring us together and connect us, transcending boundaries that often divide us. This is a must read and must have for one’s library. 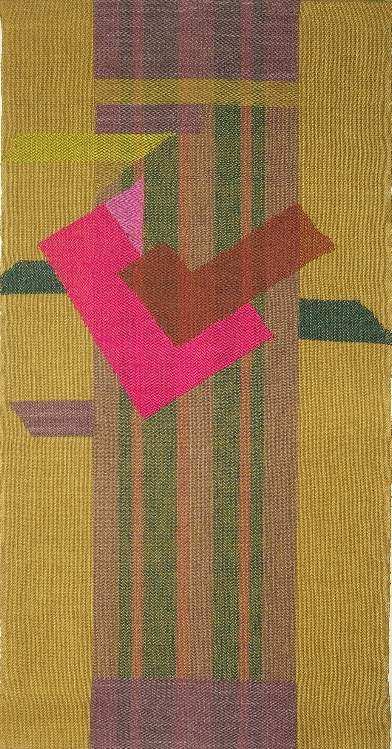 Fiber Artist, Esther J. Kolling, had an infinitely curious mind that lead her to create works ranging in techniques from macramé, sprang, and basketry, to ikat, double weave, complex weave-structures, inlay, and tapestry. 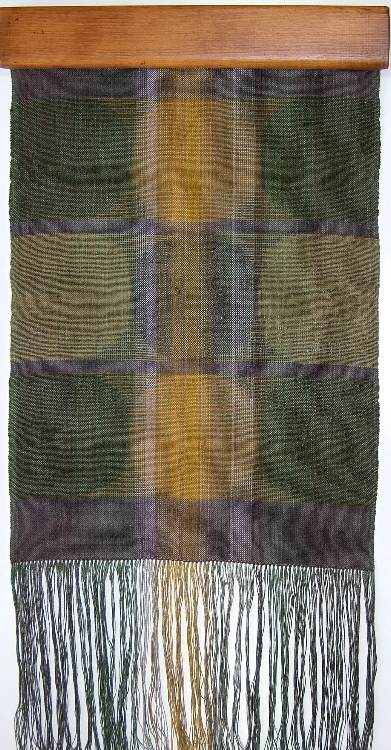 During the 1970’s – 1980’s her award-winning works were exhibited nationally at the Museum of Contemporary Crafts in New York City and at the Denver Art Museum, as well as regionally at Midwest Weavers Conferences and Kansas Artist Craftsman. Esther Kolling was also my mother. When I was about 3 years old and Esther Kolling was in her late 30’s, she discovered her artistic leanings through ceramics, mosaic, drawing and painting classes that she took at the local college. During the height of the 1960’s, she pursued her masters degree in art education over the course of six summers at the University of Colorado in Boulder, and at the end of each summer, she transitioned back to her life in small town Kansas. How difficult it must have been to go from the spirit of the 60’s in full swing, classes that stretched her, and studio space to work in to none of that. There was no separate room available for her to work on art in our 800 square foot home totaling five rooms: the kitchen, living room, bathroom, my parent’s bedroom, and the bedroom my older sister and I shared. Esther often did art on the kitchen table or at the living room desk during the day while my sister and I were at school, or late at night, after everyone had gone to bed. I remember going to sleep to the sound of the brayer squeaking while she made wood block prints. She also kept taking art classes at the local college, to have access to studio space, and stay artistically active in between summers. Toward the end of her degree, she joined the Wichita Weaving Guild. There she discovered her love of fiber: macramé, sprang, vegetal dyes, spinning, weaving, and later complex weave structures, ikat, and tapestry. Soon I was joining her in slow drives along country roads, helping to collect dye plants growing along the ditches and on hillsides. The house began taking on the peculiar odors of dye bathes out of mullen, coreopsis, sedges, walnut hules, onion skins, and marigolds. Evenings would find her carding and spinning wool. She made a place for her 48” width Macomber loom after measuring an area on the edge of the living room that bordered the kitchen. She removed a chair and shifted over a plant stand. Not a room of her own, in the sense of Virginia Woolf, but an area for her to work, with light from the west picture window. I was fascinated by watching her weave, and wanted to learn. She showed me how to warp up a cardboard loom and the basics of over and under, gave me an assortment of yarns and a large needle, then left me to explore on my own. When I finished that weaving, she put together a frame loom out of canvas stretchers for me. I was all of ten years old, and I felt a kinship, a contentment when weaving tapestry that I never before had experienced. I loved how my hands could make hills, valleys, angles, and shapes in the warp. As my mother learned new techniques, so did I. By the time I was in my early teens, I was her teacher’s assistant in the community continuing education classes she taught at the local art center. Together we taught macramé and non-loom techniques, as well as beginning weaving. Over the years, Esther Kolling taught workshops in dyeing through the Wichita Weaving Guild, and weaving at Southwestern College. She regularly juried into and won awards in the Kansas Fiber Directions exhibitions, as well as the War Eagle Arts and Crafts Fair in Arkansas. 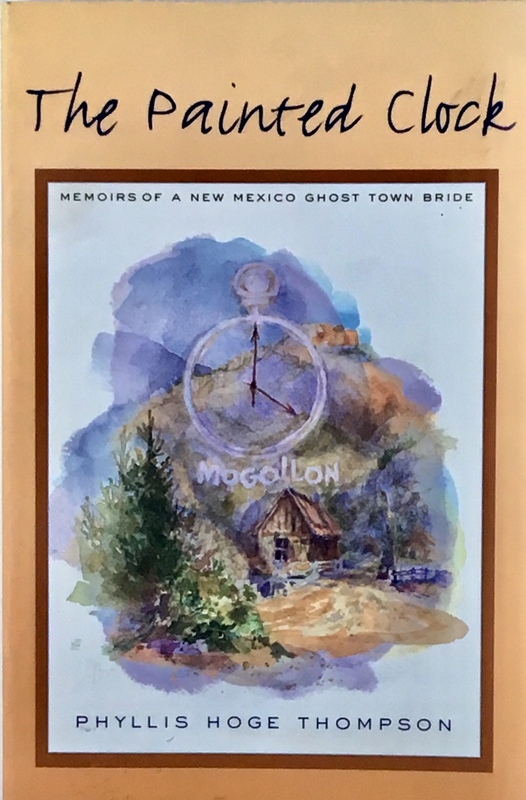 Her gallery representation included The Sign of the Acorn in Wichita, Kansas and later in retirement, the artist coop gallery in Socorro, New Mexico. Esther Kolling’s creative process involved working from sketches or a thumbnail design, taking a small section and expanding it or superimposing it onto another design. The composition would evolve and change as she kept working with it. At the loom, she would add or delete design elements as she wove. 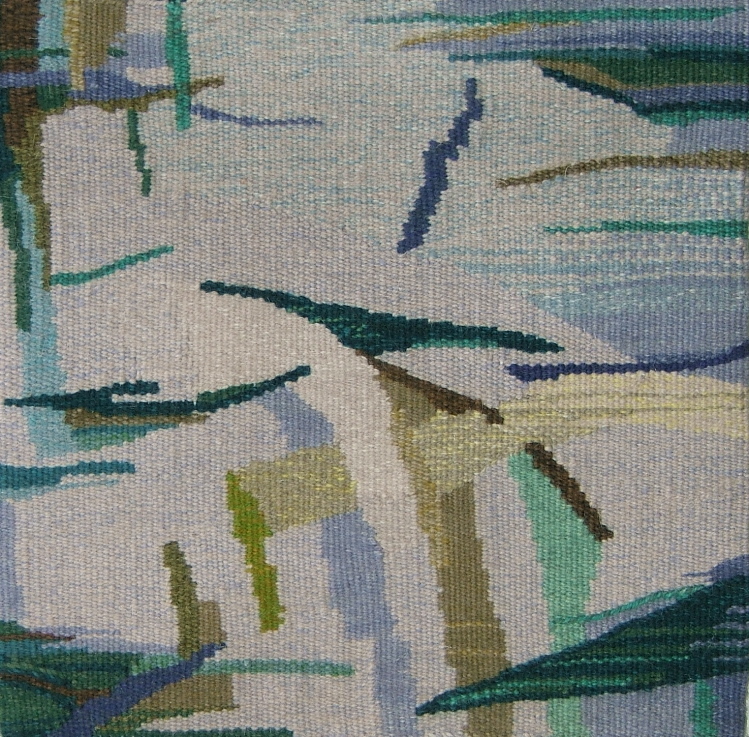 In the tapestry, Flight, she used slits to create vertical lines, and combined woven shapes with some irregular hatching, using both commercial and her handspun yarns, as well as weft bundles of varying textures. In Reflection, her vertical lines are woven and double-weft interlocked. She blended via weft bundles of her hand-dyed yarns with some pick-and-pick and irregular hatches. Later in life, after moving to Socorro, Esther Kolling’s entire townhouse became her studio, filled with multiple looms, spinning wheels, an extensive textile library, and a sizeable yarn stash, with inventory including her hand-dyed wools, cottons, silks in varying weights and quantities. These she kept saving for “special projects” that she never lived long enough to create. She had six years in this space, exploring a range of techniques in textiles from Africa, Japan, Indonesia, Peru, Guatemala, and the desert Southwest. Her later work became a blending of ethnographic elements into her own designs and sketches, evolving an idea through many steps until it became a reflection of her own consciousness. After her death, I sorted through the 57 file boxes of yarn she had in her stash. Her hand-dyed yarns are now part of my inventory in my studio, which is about the size of the house I grew up in. I make sure to include something from her “special projects” stash in each of my tapestries, so that her artistic legacy continues in the flow of yarn that her hands touched and now passes through mine while I weave.